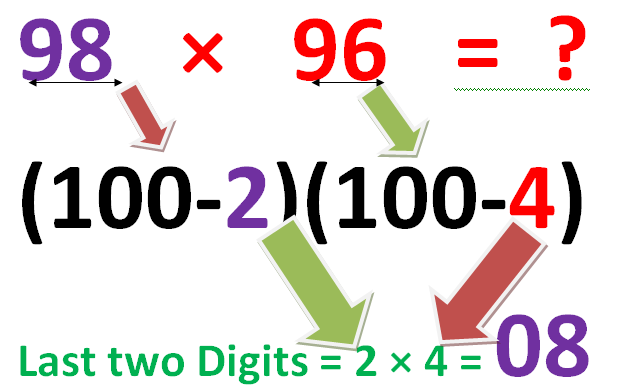 Today we are going to learn shortest method of multiplication for two numbers which are very close to 100 ,which can save our time in competitive exams . Consider both the numbers as Num 1 = 98 and Num2 = 96. Subtract Num 1 from 100 and write its Result 1 as one place . Also Subtract Num 2 from 100 and write its as Result 2 second place . 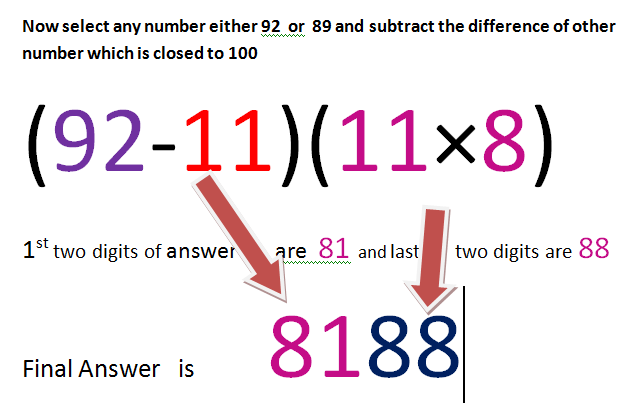 Subtract the result of Result 1 (blue Answer) from Num 2 i. e.(96 ). 92 * 91 = ? Now select either of the given number (suppose 92 ) and subtract the number ( other than 100 ) which is in other factor in previous step i. e. 11. The difference of 92-11 will the 1st two digits of our answer and product of other two digits are the 3rd and 4th digits of the answer.